Even as I graduated to adulthood (and culinary school), moving past silly childish dislikes, I hated these little cabbages. Until a friend made a batch of roasted Brussels sprouts with bacon at our house. Now I’m addicted. The act of roasting concentrates the flavor and natural sugars in any vegetable so they emerge from the oven crusty and full of goodness. Recipes works well with broccoli and cauliflower too. Leftovers reheat really well! And, well, bacon makes everything better. no? Try this with any Syrah or Shiraz as a fantastic wine pairing. Look for one here. In a large bowl, toss together all but the bacon. Spread the sprouts evenly in a roasting pan or baking sheet, making sure it’s all in one layer. Sprinkle the bacon evenly over them. 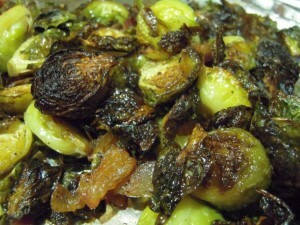 Roast for 25-30 minutes, stirring and tossing the sprouts every 10 minutes or so to help brown them evenly. Remove from oven and drizzle with balsamic vinegar, if desired.